Bernie Sanders’ biggest obstacle to securing the 2016 Democratic nomination is no secret. As I noted last July in an interview with WCAX’s Alex Apple, Sanders started his campaign with a built-in progressive constituency comprising roughly 30% of likely Democratic voters. To expand that coalition, however, Sanders needed to accomplish two related objectives. First, he had to demonstrate why his single-minded focus on addressing economic inequality should appeal to minority voters who make up a significant portion of the Democratic electorate. Second, he needed to attract more moderate Democrats who were initially inclined to back Hillary Clinton, the Democratic front-runner heading into the presidential campaign. Toward that end, Sanders has worked assiduously to broaden his appeal to minority voters, in part by addressing concerns raised by the Black Lives Matter movement. He has also worked hard to show how his economic policies will help the middle class. It has always been clear what Sanders’ electoral strategy will be: he hopes that a strong showing in the Iowa caucuses and New Hampshire’s first-in-the-nation primary will both give his campaign credibility with the Democratic party establishment while casting doubt on the perception of electoral inevitability that Clinton, the purported front-runner, has tried to create. Toward this end, New Hampshire is perhaps the linchpin to Sanders’ electoral fortunes. 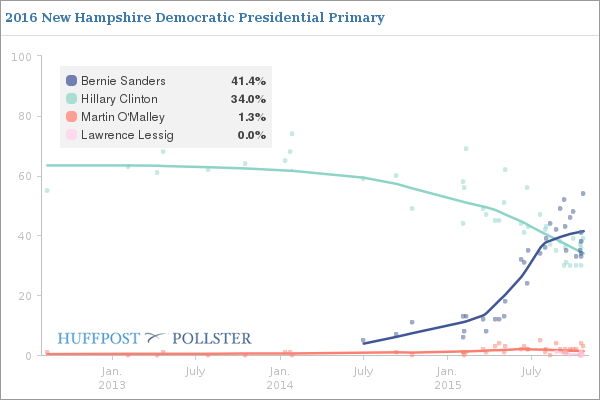 After several months in which Sanders gradually pulled ahead of Clinton in Granite State polling, more recent state surveys suggest that Clinton has begun to regain some support among New Hampshire Democrats. Three of the last six NH polls have Clinton ahead of Sanders by margins ranging from 2% to 8%, although the one poll among this group that does not include Vice President Joe Biden’s name has Sanders leading Clinton by 15%, 54%-39%. Nonetheless, in an indication of how important New Hampshire is to Sanders, media reports indicate that he is about to run his first television ad there and in Iowa. Among other issues, the ad will highlight Sanders’ civil rights record and his vote against the Iraq War. Clinton, in contrast, has been running television ads in New Hampshire for several months now. Given New Hampshire’s strategic importance, your intrepid blogger decided to attend Bernie’s rally yesterday in Lebanon, New Hampshire, a small middle-class, largely white suburb (population about 13,500) just across the Connecticut River from Vermont. My goal was to see if Bernie’s message was catching on, and if so, with whom. We arrived at Lebanon High School forty minutes before the scheduled start of the event, only to see a substantial line of people stretching 100 yards waiting to get into the high school gym. 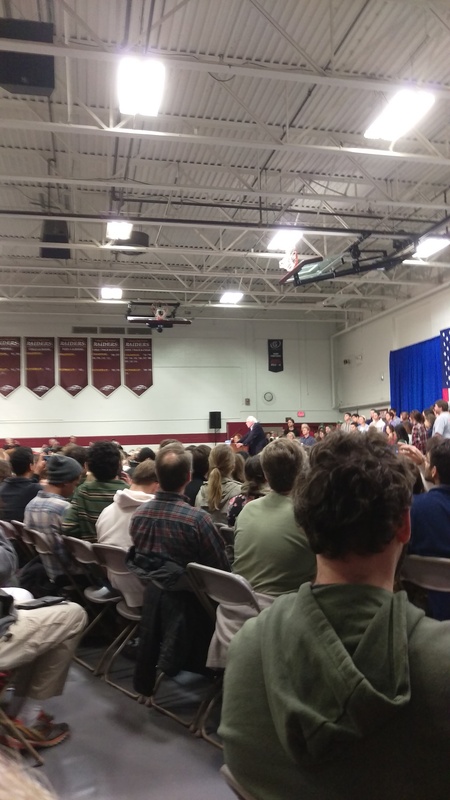 Our timing was fortuitous, as we were among the last allowed inside the gym – those behind us, numbering about 300, were shunted to an overflow location where they watched Bernie on a televised feed. Event organizers indicated that some 2,400 people made it inside the gym – a far cry from some of Bernie’s larger outdoor audiences, but still bigger than the crowds attending the Kasich and O’Malley New Hampshire events I blogged about earlier. It soon became apparent that in contrast to the Kasich and O’Malley events, in which audience members seemed eager to learn about the respective candidates, the Sanders’ crowd was already #Feeling the Bern. Rather than the traditional Yankee flinty skepticism for which New Hampshire voters are renowned, this turned out to be a giant pep rally, in which almost everything Bernie said drew sustained applause. Not surprisingly, given the demographics of Bernie’s core supporters, most of the audience seemed composed of college-age or younger students, although there was a healthy mix of age groups. The event began with a couple of speeches from local high school students talking about why they support Bernie, followed by a rousing set piece from a Sanders campaign aide designed to stoke the fires. And then Bernie entered, to a standing, sustained ovation. After beginning with a joke – “I’m really Larry David!” – Bernie launched into his familiar jeremiad against economic inequality and the billionaire class. Across the span of an hour he covered the usual topics: the vast scale of economic inequality (“the worst since the 1920’s”), Republican hypocrisy on “family values”, particularly their opposition to abortion, LGBT rights, and medical and paid family leave. Sanders pushed for increased federal spending on infrastructure, a federal jobs program, a higher minimum wage, more money to hire teachers and an end to trade agreements that cost domestic jobs. He railed against Citizens United and campaign finance laws that favored the wealthy, forcefully advocated for policies to address climate change, and pushed for expanded health care coverage. Near the end of his speech, in a line that drew perhaps the loudest applause of the rally, he called for an end to institutionalized racism, noting that this should not be a country where “I get dragged out of my car, thrown to the ground” and end up dying in jail in three days because of one’s skin color. Several aspects of Sanders’ speech stood out, beginning with the concluding emphasis on ending institutionalized racism – a calculated effort to reach out to the BLM movement. Bernie, and his followers, understand that attracting minority support is critically important if he is to do well in the states immediately following New Hampshire, particularly South Carolina and Nevada. Second, he said absolutely nothing about foreign policy – nor did anyone ask him about it during the question and answer period (more on that below.) Third, Sanders’ delivered his hour-long talk with passion and energy, moving smoothly from topic to topic, understanding when to pause for applause, and modulating his tone as appropriate – all in all it was a well-delivered, polished stump speech. Noticeably, although this was at least his second town hall event of the day, he showed absolutely no sign of fatigue – impressive for a 73-year old man! Finally, Sanders never once mentioned Hillary Clinton by name, although she was clearly on his mind when he acknowledged early on that he lacked endorsements from the party establishment and had no Super Pac funding. “I’d rather have the people than the politicians,” Bernie railed, to thunderous applause. He also sought to push back against the perception that his campaign was “utopian”, several times noting that “it is not utopian to…..” followed by a list of goals, from providing health care to all to making corporations pay their “fair share” to expanding economic security. He ended by asking his audience to join in the “political revolution”, and most seemed quite willing to do so. Bernie fielded eight questions after his talk, ranging on topics from transgender rights to how to break up banks to addressing sexual assault on campus. The most critical question came from a small-business owners who askied how small businesses were supposed to pay for an expanded family leave program. Sanders noted that it would require higher payroll taxes. A second questioner lauded Bernie for almost all his positions save one: “You are weak on gun control.” Bernie, however, pushed back, saying he was unfairly targeted on this issue, noting that he voted for expanded background checks and ending the so-called “gun show loophole.” But he also pleaded for compromise, arguing for the need to bring the 60%-70% of people who agree “on common sense gun control” together to pursue solutions, rather than demonizing gun owners. It is hard not to be impressed with the enthusiasm of Bernie’s supporters. They are committed to the man, and his cause, and I have no doubt they will turn out to vote for him. They could even make the difference in low-turnout caucus states like Iowa where the intensity of support can matter more than its breadth. At the same time, it is not clear to me how many new converts Bernie is winning over with his message. At one point, a show of hands indicated that nearly half those in attendance at the Lebanon event were Vermont residents! On the one hand, this is not surprising given the location of the talk less than a mile from the Vermont border. On the other, it is a reminder that even in New Hampshire, a state bordering his own and one in which demographics would seem most favorable to him, Bernie is still in a dogfight with Hillary Clinton – a point reinforced by recent polling. Are New Hampshire voters #FeelingtheBern? Some clearly are – but at this point it may not be enough to bring victory next February. As we contemplate what may happen, I leave you with the song that ushered Bernie supporters out at yesterday’s event, sung by a man who, ironically, isn’t much younger than Bernie! Rock on, America!